Art is an important form of expression, ingenuity, and creativity. At the Lower School, students experience a diversified and professional arts program delivered in a way that is uniquely Nueva. Our programs in all arts disciplines are designed to preserve the creative dispositions in young Nueva students — a deep and uninhibited sensory exploration, a need to express themselves, and a passion for creating. Choice is a foundational principle of a Nueva education, and students select from a wide array of arts offerings. The Lower School visual arts program emphasizes art-making and the creative process. Direct physical engagement with media such as clay, papier-mâché, wood, and found materials is a key component of the program. Nueva teachers and students celebrate inquiry, experimentation, exploration, and personal expression within a flexible and evolving project-based structure. As students develop skills, they incorporate observation, invention, collaboration, and storytelling into their work. Students have freedom to experiment with a wide variety of materials to creatively achieve their vision. 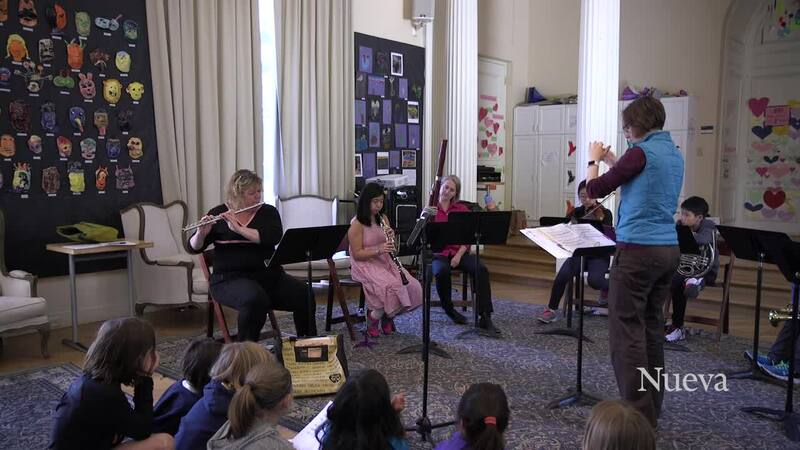 The Lower School music program encourages a broad appreciation of music across grades. The curricular focus is on choral and general music instruction, including skill building around listening, rhythm, notation, movement, dictation, music history, improvisation, composition, analysis, and performance. All students are exposed to a variety of musical tools designed to foster musical growth, including Orff instruments, hand percussion, recorded music, notation software, and theory coursework. Lower school students frequently share their music with classmates and the school community though performance — Brown Bag lunchtime performances, all-school concerts, grade-level music nights, evening recitals, and public performances. All performance opportunities are extensions of the classroom and individual instrumental study and showcase the curricular focus of both the classroom instructor and private-lesson experience. The choral portion of the Lower School music program begins in second grade. These large ensembles sing pieces from a variety of cultural and musical perspectives, including classical, folk, modern, and choral music in world languages. The pedagogical focus of the second- and third-grade choir is the encouragement and growth of basic musical skills, including group cohesion, pitch, breath support, diction, dynamics, and following a conductor. The fourth-grade choir continues from this foundation with the introduction of more advanced musical ideas and repertoire, with special attention given to preparing for musical presentations. Frequent participation in performing arts helps Nueva students learn to express themselves in many ways, gain comfort with taking risks, and become confident performers. They learn and grow rapidly — from facility with language to awareness of their bodies, and understanding how they think, feel, and function within the communities in which they live. Every Lower School student participates in performing arts as part of their classroom experience as performance is used to both develop and demonstrate learning. At the youngest grades, students perform to express important messages about what they’ve learned. A recent kindergarten example was a three-act play about different aspects of the oceans, written and choreographed by the students — The Fisherman (a comedy), Trash in the Ocean (a tragedy), and The Mermaids (a musical). Examples like this are found at every grade. When students reach fourth grade, they create a full-length musical as the culminating project of their year-long study of “The Path of the Hero.” Students weave together theme, story, music, lyrics, and drama, centered on their studies, though a deeply rewarding and collaborative process that stretches them to take risks, trust themselves and each other, and leave fourth grade with incredible confidence. In addition to classroom music and choral instruction, Nueva students can participate in our outstanding instrumental-music program. Nationally recognized professional musicians from around the Bay Area offer individual instruction on many musical instruments and disciplines, including violin, piano, guitar, flute, drums, voice, and electric bass. The Menuhin-Dowling Music program encourages students to deepen musical knowledge across disciplines, including theory, practice, and performance. Menuhin students make a significant commitment to the study of their instruments, receiving two lessons per week and performing on a regular basis with a focus on great master composers' music.